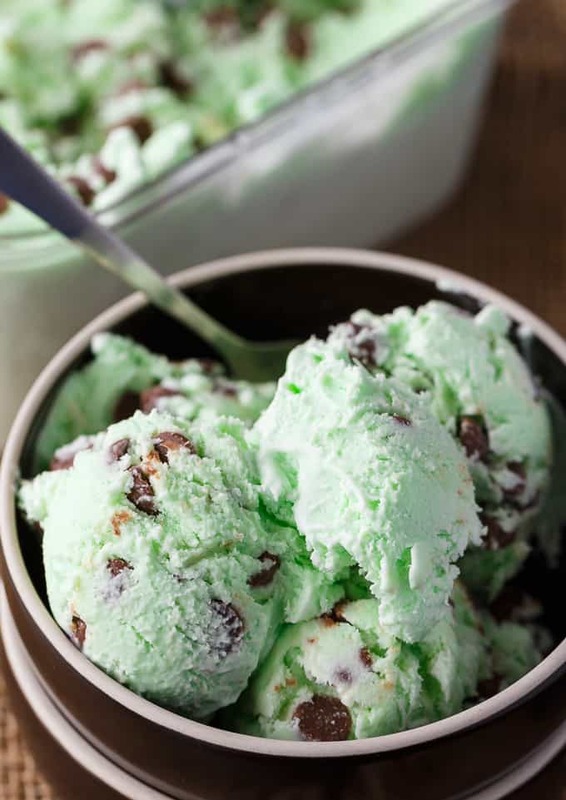 Is there anything better than a big bowl of Mint Chocolate Chip Ice Cream on a hot summer’s day? I have fond memories of biking to our local dairy (Pembroke residents will know the iconic Brum’s Dairy). My friend and I used to get big scoops of Mint Chocolate Chip Ice Cream in a waffle cone. It was our favourite. The flavours bring me back to my childhood summers. I love making my own no-churn ice cream. I own an ice cream maker, but I rarely use it. No-churn ice cream is just too much simpler that I can’t be bothered. The hardest thing is waiting for it to freeze! Today is Chocolate Ice Cream day so I wanted to share something that you could make to celebrate this special occasion. 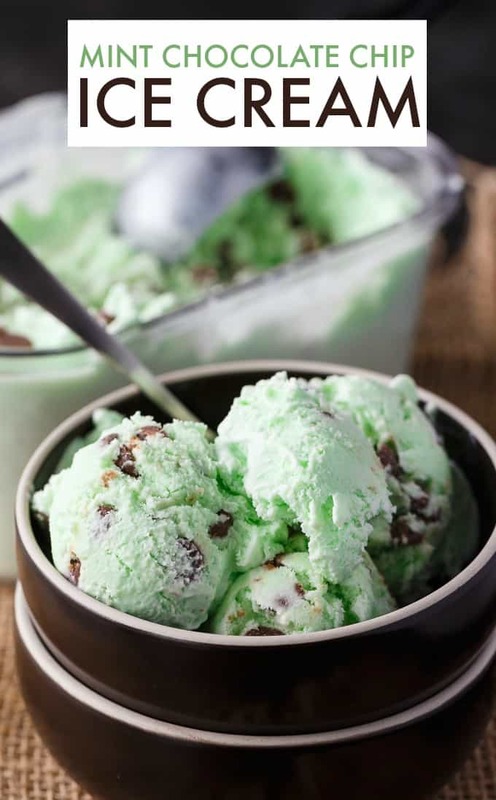 This Mint Chocolate Chip Ice Cream is easy to make and so delicious to eat. 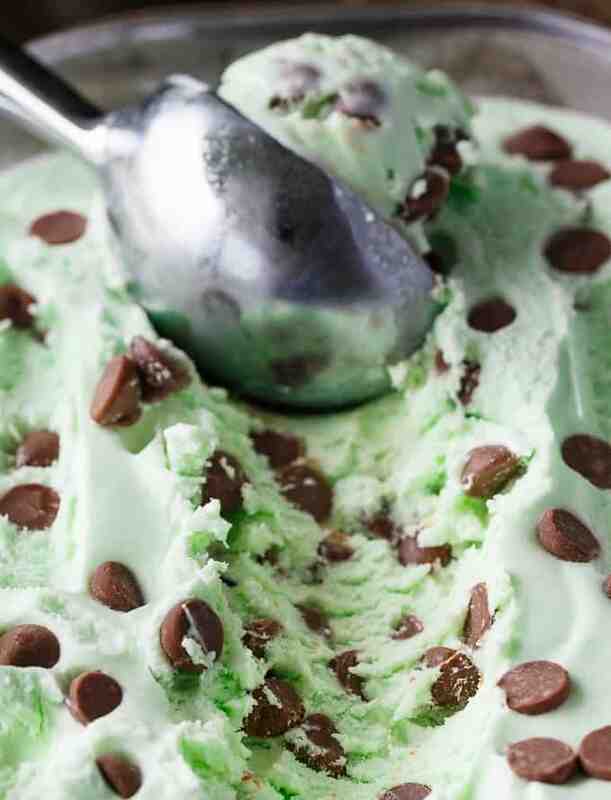 It has just the right amount of minty flavour blended in with a pop of chocolate from the milk chocolate chips. I had some friends over the day after I made this recipe. My friend, Tina, said that it was “the best ice cream she has ever tasted”. Wow! That made me feel happy because I want people to enjoy the recipes I share. 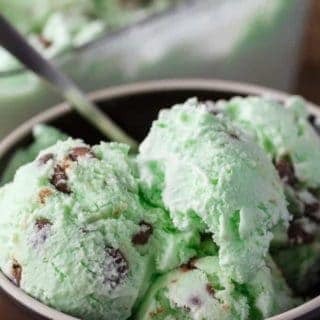 Expect each bite to be creamy, minty and sweet. You can use your own homemade mint extract if you like. The green colour is from green food colouring. I didn’t specify the amount of drops to use in the recipe below because it will depend on the type of food colouring you use. Some are more potent than others. I recommend adding a few drops and then stirring to see if you like the colour. Keep adding drops until you research the green you like. You could also leave out the food colouring and it won’t affect the flavour. It just won’t look minty green. Like I said, this recipe requires NO ice cream maker. 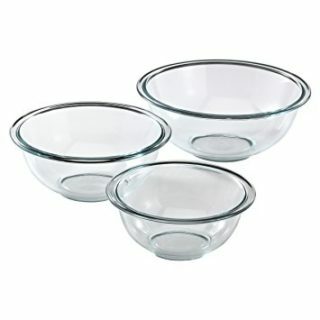 In a large bowl, beat the whipping cream on medium speed for 4 minutes or until it starts to form soft peaks. Reduce the speed to low and pour in the sweetened condensed milk. Beat until it’s combined. Stir in the mint extract, green food colouring and chocolate chips. Pour mixture into a freezer safe container. 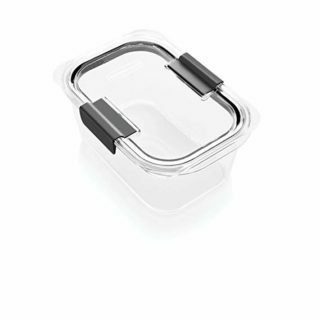 I like the Rubbermaid Brilliance containers. Put in the freezer for at least 8 hours. I leave mine in there overnight. For more no-churn ice cream recipes, try my Maple Pecan Ice Cream, Toasted Marshmallow Ice Cream or Chocolate Cake Ice Cream. 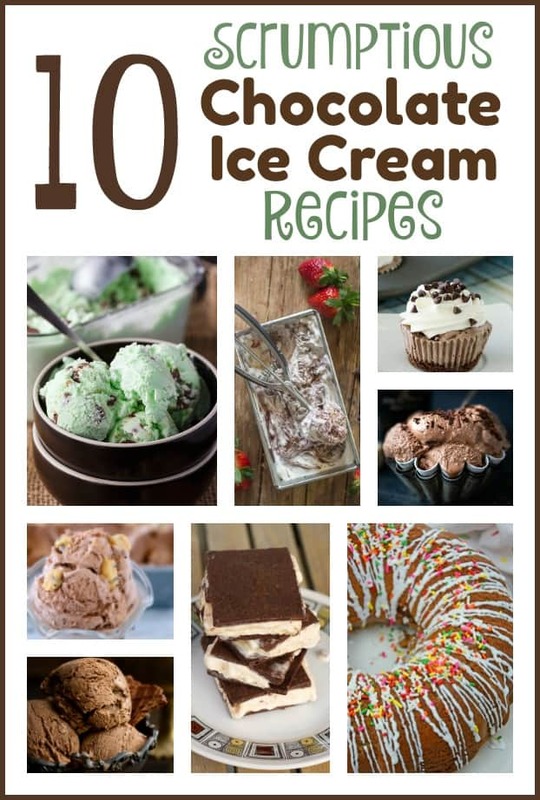 You might also like these chocolate ice cream inspired recipes for Chocolate Ice Cream day shared by my blogger friends. 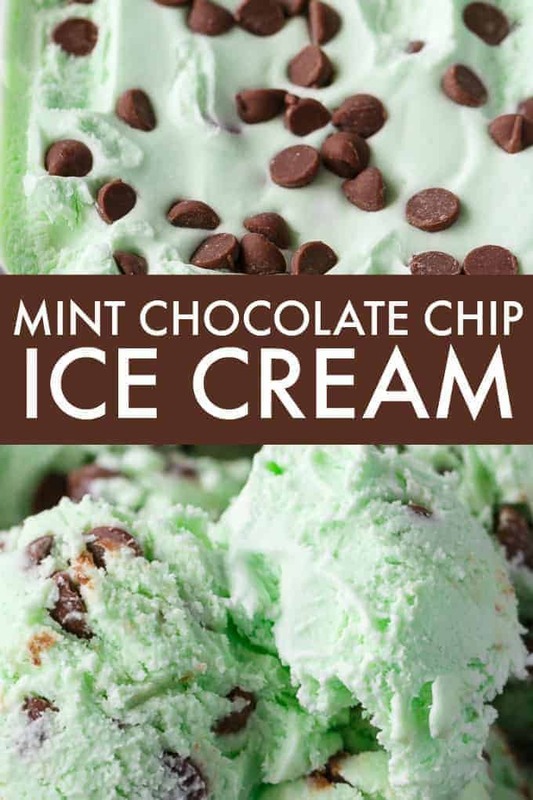 Perfectly minty and sweet with a hint of chocolatey deliciousness. This easy no-churn ice cream recipe couldn’t be any simpler to make. 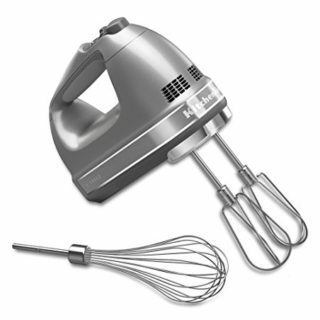 Beat whipping cream on medium speed for 4 minutes or until it starts to form soft peaks. Reduce speed to low and add in sweetened condensed milk. Beat until combined. Stir in mint extract, green food colouring and chocolate chips. Oh my goodness this looks to-die-for! Ice cream is my weakness! 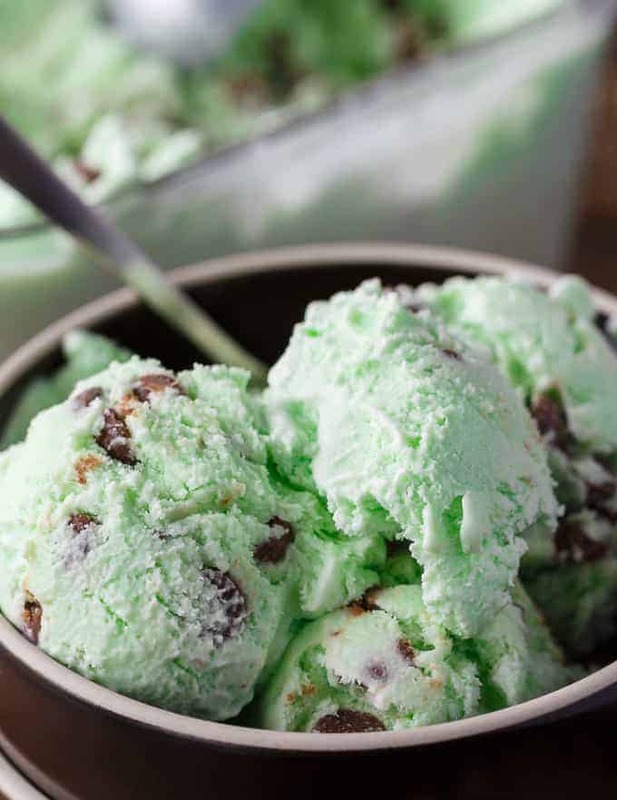 I have always loved mint chocolate ice cream. This recipe is so simple. I can see that the hard part would be to wait for it to freeze! I do like that I don’t need an ice cream maker to make this recipe. Thank you for sharing at A Round Tuit. YUM! I need this in my life! That is my daughter’s very favourite ‘special’ flavour of ice cream! Chocolate is her favourite everyday one, make sense out of that, lol. 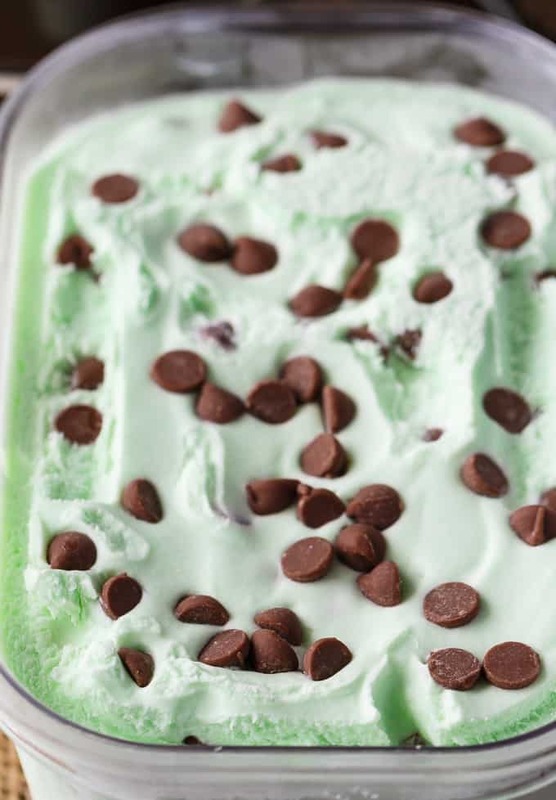 I haven’t had mint chocolate chip ice cream in ages and have never thought to make it myself! Yum! Yum, my favourite flavour of ice cream, thanks for the recipe. My favourite ice cream 🙂 have never tried making my own before but it doesn’t seem too difficult . Would be a great weekend to give it a shot . Thanks for sharing the recipe . Looks and sounds delicious! If you did want to make it in an ice cream maker so I dont have to wait the 8 hours how would I go about doing that? Thanks for sharing!